Card Golf is essentially the game of golf in a box. It can be played alone or with a group of two, three or four players. Each player is randomly dealt 14 club cards. The game is played and scored using a scorecard from any golf course in the world. Players must combine the club card yardage in their hand to match or exceed, by as little as possible, the yardage of each hole on the scorecard. New players are typically hooked after the first or second hole. It’s simple, it’s straightforward, it’s golf in a box. 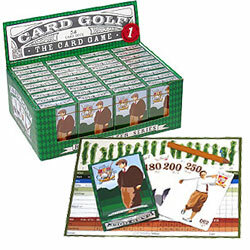 The Card Golf game features 51 beautifully designed club cards, a couple scorecards and complete instructions on how to play this fun new game. Small and lightweight to fit in a golf bag for play before or after a round of golf. The perfect golf gift, fathers day present or stocking stuffer for the golfers in your life. 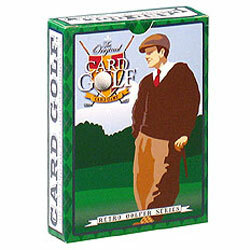 Click here to see some products CARD GOLF has shared with ToyDirectory and TDmonthly Magazine. ©1996-2007 ToyDirectory.com, Inc.(R) All rights reserved. All logos, brands, and product names listed are trademarks and property of their respective holders.